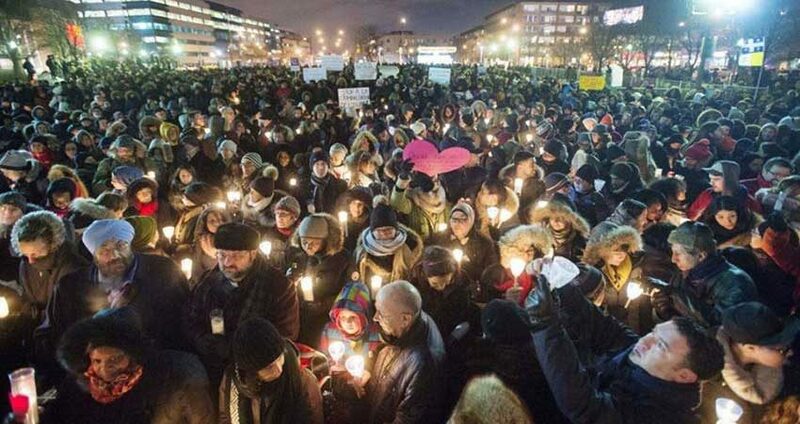 Tuesday, Jan. 29, 2019 marked the two year anniversary of the Quebec City Mosque shooting. The shooting took the lives of six innocent men in their place of worship: Mamadou Tanou Barry, 42; Abdelkrim Hassane, 41; Khaled Belkacemi, 60; Aboubaker Thabti, 44; Azzeddine Soufiane, 57; and Ibrahima Barry, 39. On Jan. 29, 2017 gunman, Alexandre Bissonnette, 27 at the time, entered the Islamic Cultural Centre Mosque of the Saint-Foy region of Quebec City, and shot seven bullets, the injured 19 and took the lives of six in the city’s biggest mosque. This past March, he pleaded guilty to six counts of first-degree murder and six counts of attempted murder. While the tragedy took place hundreds of kilometers away, the incident still resonates with the community of Waterloo. The Waterloo region remembered the mosque shooting victims in Kitchener City Hall. The room was filled with people of different faiths to pay their respects. “We all need to come together to say your pain is my pain and we stand with you [the families and community affected by the shooting]. The commemoration was organized by the Coalition of Muslim Women (CMW) who invited community leaders of different faiths and notable people within the community to join them. The CMW of Kitchener-Waterloo is a federally incorporated not-for-profit organization with the vision of a community where Muslim women are recognized as leaders to enhance communication and understanding between themselves and the larger community and actively participate as leaders. Members of the CMW, Imam Kabbar from the Islamic Centre of Cambridge, Pastor James Brown, Kitchener Centre MPP Laura Mae, and Kitchener South-Hespeler MP Marwan Tabbara are a few of the speakers who honored the victims and first respondents of the shooting. Islamophobia has been a rising issue around the world. The gathering was an opportunity to address the issue, and for the community of KW to congregate and overcome it together. Fauzia Baig, the director of community engagement and outreach addressed the fact that all the individuals who attended the even were breaking down barriers together by simply attending. “We’re putting ourselves out there for you to come and meet and get to know us,” Baig said. Kitchener Centre MPP Laura Mae joined to pay her respects and gave a compelling speech on the topic of Islamophobia and western media. “When there’s a news story or report of somebody who says they are Muslim, that claims that tradition and especially uses that as a rationale to harm, innocent Muslims that are actually living Islam in the way that it should be lived with love, compassion, and care; are targets,” Mae said. Kitchener South-Hespeler MP Marwan Tabbara attended the memorial and brought a letter written by Prime Minister Justin Trudeau to honor the victims. Various religious leaders lead prayers throughout the commemoration. Imam Kabbar began his prayers by apologizing for those individuals who have used Islam as an excuse to harm others. “I want to say to people around me that any person who did something bad, doesn’t represent me or Islam. And if somebody did something like that I want to apologize for people in fear. Our job is to try our best for good people to come together and work together to try to stop [violence and Islamophobia]” he said. Following Imam Kabbar’s address Pastor James Brown from the Christ Evangelical Lutheran Church of Waterloo lead a Christian prayer stating that it was an honour for him to be invited to such an important event. “Regardless of anyone’s faith it is everyone’s responsibility to care for others,” he said. Commemorations were held across the country. Commemorations, vigils and lectures were hosted throughout the week of Jan. 28 from coast to coast to address the issue of hate, violence, and Islamophobia in Canada. Documentaries directed by students across Canada, as well as various organizations, discussed hate crimes in Canada and how families and both religious and ethnic communities are directly impacted. This was done by filming the lives of the family of the men who lost their lives and the rehabilitation of the injured individuals that day. People of all different faiths and backgrounds came together to honor the victims who were affected by the incident. The National Council of Canadian Muslims are asking for Jan. 29 to be designated as a national day against hate and intolerance. Canadian Heritage Minister, Pablo Rodriguez stated that the federal government is still in discussion to identify an acceptable way to honor the victims and their families. Is the university addressing student needs?